During a sales presentation of a project management software solution, the vendor typically speaks about resource management and resource assignments on an individual basis. In this scenario, the resource pool is comprised of individual, named people. In some cases the individuals have additional attributes such as a specific skill or be part of a larger resource group. For example, Bob may be an engineer and may be part of the Engineering resource pool. Kevin may be a designer and part of the Design pool. The intent is that Bob would be assigned to a task that requires Engineering and Kevin assigned to tasks involving design. TimeControl is very happy to work in the manor if desired. 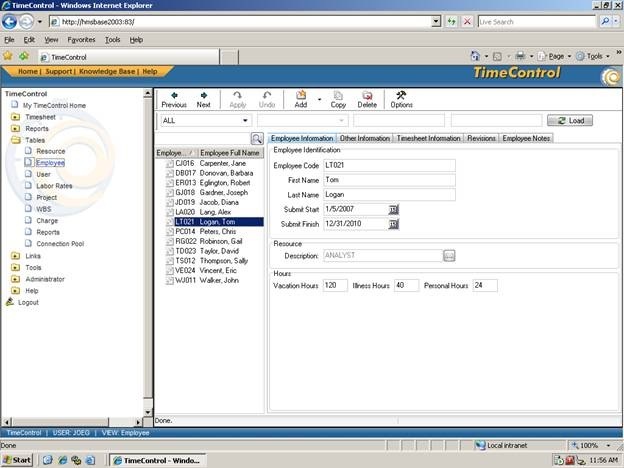 Each person making a time sheet within TimeControl has the option of being “related” back to a resource code in the supporting project management system. During the transfer between TimeControl and the PM system, resource information, including assignments is part of the data being shared. Once the timesheet has been completed, hours that Bob has entered for his Engineering tasks get transferred back to the PM software as actual resource hours for the Engineer / Bob code. 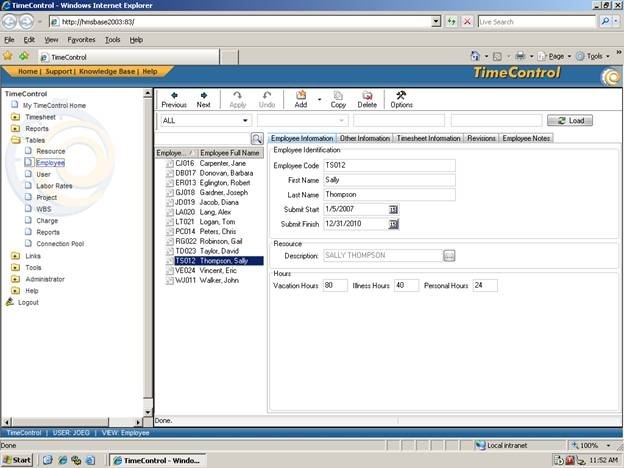 In this scenario, the resource codes in the PM software represent an individual and match the TimeControl employees on a one to one basis as per the example shown in this screen capture. In this example, and hours entered by the employee Sally Thompson resolves back to the individual resource code Sally Thompson in the schedule. Recently I have spoken to several companies who are using their PM software with generic resources and wish to transfer the hours worked by an employee, from TimeControl back to the generic resources. Using generic resources is a very common project management practice in involves doing the planning at a group level such as Engineers, planners, programmers or similar. The resource pool in the PM software is comprised of group codes, and may or may not have individual codes. The project manager assigns tasks to the group code and the line supervisor decides who will actually do the work. The employee who works on the task enters their hours in TimeControl and that data is ultimately returned to the schedule as progress. If an employee in TimeControl is linked to a group resource code (also known as a resource pool code) the total hours for all of the employees who are linked to that resource code will be transferred back to the schedule as progress. An example of this type of reference is shown it this screen capture. In this example hours worked by Tom Logan are resolved to the resource pool code Analyst in the schedule. In the case where an employee worked on a task and is a member of a resource group that was not originally assigned to the task, TimeControl can be set to create the resource assignment in the schedule as a part of the transfer process. TimeControl can be used with employee specific resources or with generic resources or a combination of the two, depending on the requirement of the Project Office. Previous PostImporting legacy timesheet data into TimeControlNext PostWith 5.1.6 comes a bunch of speed! Hi Chris V, Ken – In your final comment, it indicates that a company can define individual or group resources or BOTH, in their projects. However, because an individual employee only has one field containing their known Resource ID for the PM Tool(s)linked to TC, it implies that each Employee has to choose whether to be a unique, individual resource such as Sally Williams, or ‘belong’ to a group resource such as Fitter ? This makes life a bit difficult if I happen to be a Fitter, but am also an excellent Stainless Steel Welder known as Chris L-F !! Comments ?